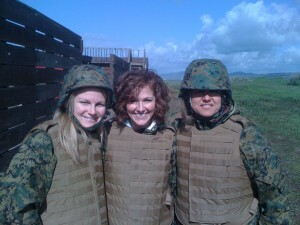 I spent last week in San Diego learning serious lessons from the Marines. It was a life changing experience for me in respect to organizational leadership and understanding what true “transformation” looks like. The Marines know what they are about. The few. The proud. They live and breathe their vision and mission daily. It is a thorough belief from a first week recruit to a retiring general. They believe in what they do. They have created, followed, and lived in a system that supports that belief at every step in every level. Honor. Courage. Commitment. While I was there, I was pulled back and forth between the world of the “Semper Fidelis” (Always faithful) to the world of “Ancora Imparo” (Still, I am learning. ~Michaelanglo). I realized there were so many parallels between our worlds and yet, we were worlds apart. One very long and serious conference call with our district’s leadership happened on Wednesday just after I finished successfully navigating the bayonet assault course. We had to discuss the possible implications to continuing state reduction in funding both this year and for the next two. The cuts we were contemplating were considerable in sum and required to be sustainable. The battles of physical and mental were metaphorically comparable. 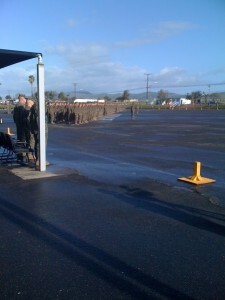 On the Marines’ assault course, you run to the next obstacle with weapon ready yelling, “AAAHHHH!” then entire way. The battle ready stance absolutely fit my conference call. Just to give you some perspective, here is a quote from the latest School Administrators Coalition (SAC) (March 5, 2010). “Current year revenue collections continue to fall below expectations. February revenues were down more than 14% over February 2009 collections. To date, fiscal year collections are lagging 12.7% behind. The Governor has indicated that state government must downsize further. Additional withholdings in the current fiscal year are expected.” Our state is short of funding, and that will directly impact us in education. I stood in the middle of that concertina wire on that practice battle field, and I knew the parallel – and I knew we had to be ready. 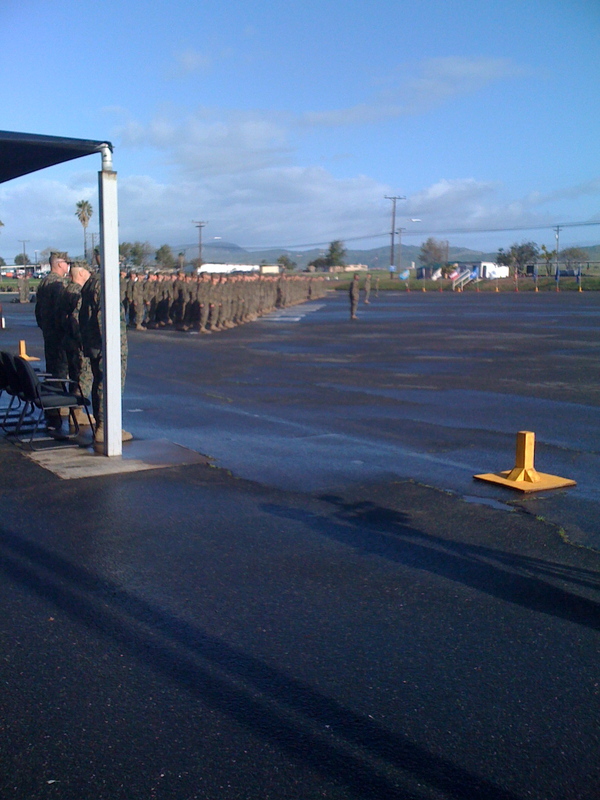 I realized, not unlike the recruits at the Marine Corps Recruiting Depot getting the future warriors ready for battle, there was a direct connection to what we were doing at Benton in respect to our professional development this year and planning for next year as we enter our school improvement planning for 2010-2011 – we are preparing ourselves for our mission. I also realized the battlefront is changing, and it is my duty to ensure you are ready. One federal campaign that is directly fueling the fire is the Race to the Top stimulus funding. This money, which our state applied for but did not receive in the first phase, directly impacts the battle we wage daily. Despite the fact that Missouri was not among the first 16 states awarded the phase one funding, our Commissioner of Education, Dr. Nicastro, said we will hold ourselves to these high standards regardless of funding. *Missouri will implement an updated system for measuring, analyzing and aggregating student performance and growth based on the Common Core Standards; continuous improvement will be achieved through accurate, ongoing evaluation and analysis and differentiated instructional practices. *Teacher and leader effectiveness will be increased. *Effective teaching and leadership will be fostered through an evaluation methodology that is performance-based and uses evidence-based best practices. *Effective teachers/principals will be more equitably distributed among high poverty/high minority schools and chronically low-performing schools. *Missouri will offer new pathways to the professions through a variety of high-quality teacher and leader preparation programs, these will be linked to student achievement and student growth data to each preparation program and consequently made more accountable for results. *Missouri will establish a collaborative system of support for teachers and leaders focused on improving results in every school. The parallel is not unique. In order to ensure all my teachers at Benton High School are ready for the future of greater teacher accountability, we must make sure we are well trained and ready for future battles. We must train with common goals. We must believe in our goals. We must have honor amongst our ranks. We must have courage to face each day wanting to be better in our professionalism and practice. And we must – we must have a commitment to get the job done for our students. Ancora Imparo. Still. Still, we are learning. I learned so much during my week with those Devil Dogs. I don’t ever want to forget the lessons, nor do I ever want to forget to apply my learning to our organization. We can be ready. We will be ready. Benton, are you ready? This post is dedicated the men and women who serve this country and dedicate their lives to protect the freedoms we take for granted each day. From this day forward, I will be faithful to honor those few brave soldiers who serve us as Marines. Thank you for a lifetime full of insight. Semper Fidelis! Ooh-rah!